In the tradition of my self-indulgent posts--be warned. This weekend was a difficult balance of joy and despair. Despite having the grandparents down to watch our babies while Chup and I took off for a snowy, romantic sleep-over, the minute we returned home I was bogged down by the weight of the world. I know I wasn't alone in this sentiment. I shared it with everyone. I sat on the couch looking out the front window and stayed there for most of the day, peeling oranges for Squishy and reading books to Ever. My emotional capacity is always reduced when growing another human and knowing my limits I stayed away from the news. I knew if I were to read anything at all I wouldn't recover, ever. How does anyone? Then there was the issue: to wear pants or to not wear pants. I wanted to wear them but my fear kept knocking at my head. Fear that said, "What will people think of you?" My pants selection includes three maternity jeans and a whole bunch of miserable leggings I never-the-less wear every day of my life. So my pants-or-nearly-pants collection fell quite short of my Sunday Best. But something was really nagging at me, something hurt, something wasn't right and the more I thought about it, the more I realized I needed to join my sisters at church in pants. And the minute I decided to go for it, I felt the weight lifted off me, I felt positivity return to my veins. I knew I was choosing my right. After the children were in bed and the house picked up, I grabbed the keys and told Chup I was going pants shopping. He was cautiously supportive, but added "pick me up a purple tie too" (purple is the traditional color of the suffragettes). It was pretty late and I was worried the stores where my small pants budget would be useful were going to be closed. Barely I made it to the first store where I tried on a mountain's worth of clothes, pants and purple items, enough to make me feel like something might work. But my gestational appearance made all the pants fit like a well-fed grandpa in pajamas and the purple attire was more Barney than anything. Someday I hope my vanity extinguishes the last puffs of pride in me, but I'm not there yet. Moving on to the next store, I had worse luck and when the lady on the intercom rushed me with her, "It's now closing time" I panicked. At least I can pick up Chup a tie, I thought and headed to the neck-wear display. The first tie in my vision was completely purple and plaid, the next one was a Mad Men-esque black one. I wish Chup would wear black ties, I thought, they are so modern. And then it hit me, YOU CAN WEAR BLACK TIES. After I got home with the ties and our traditional roast beef for Sunday dinner, my neighbor Janna came over for a late rendezvous. She walked in through my front door saying, "I am wearing pants tomorrow!" and I cheered--silently though because the first rule of motherhood is to NEVER wake a sleeping child. We talked well into the early morning about our reasons for supporting this cause. By the time she left, I felt even more resolved and peaceful. 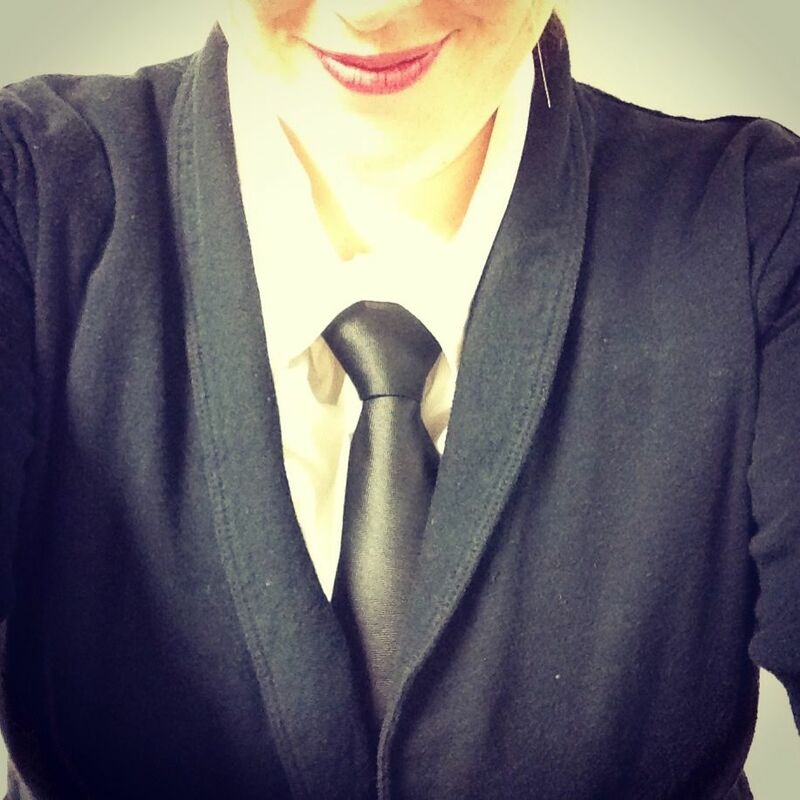 I would like to say, maybe, that the next morning when I was getting dressed I was liberated enough to tie my own tie, but no, Chup tied it for me. It was somehow symbolic though to stand tie-to-tie in the mirror as he flipped and knotted, I mean, Chup didn't feel that way ("It's too Annie Hall for me") but I felt it. When he was all done, my top knot secured at the base of my white shirt, a pang of fear hit me in the belly. Fear in the belly for me, usually means I am about to expose my vulnerability. It's nervousness at showing something I've wanted to keep hidden. Whenever I feel it, I know I am about to meet myself at a deeper level. And then we walked into church, found a pew in our half-emptied chapel (we are a ward with lots of BYU students who leave for the Christmas break) and situated ourselves. The minute I sat down I was filled with joy, I was--surprisingly--the most happy I have been in awhile. Then the first notes of Silent Night came pouring out of the organ and as I joined the congregation in singing about the birth of Christ I was reduced to tears. I actually wanted to slump to my knees and double-over and sob. I looked at my sweet children and my good husband and all of my friends and neighbors all singing together and I felt so loved. I felt like God was parting the clouds and zeroing his intense love for me right on my head. In our meeting we prayed for the families in Newtown and we prayed for more love and compassion. The ward choir sang and Sister Woodbury narrated the story of the nativity. 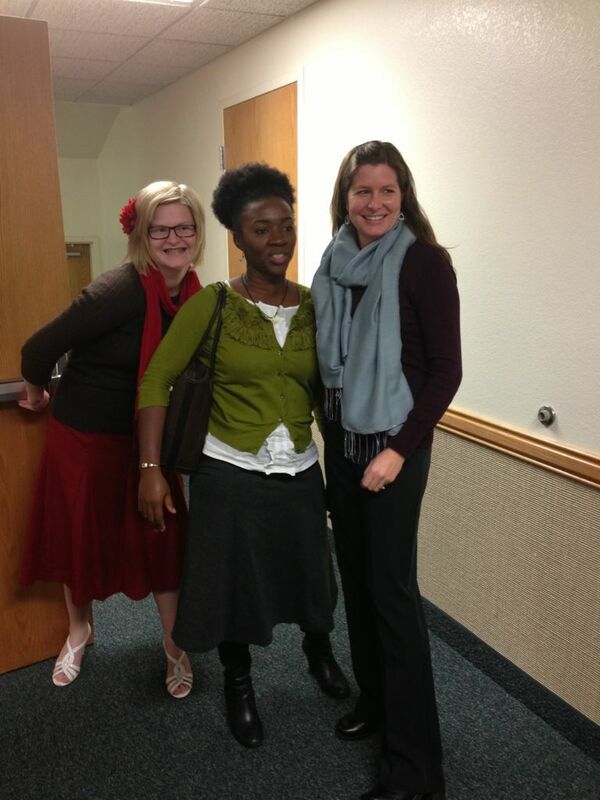 After our first meeting was over, I caught up with Janna and several other sisters wearing pants. There was a moment of solidarity for certain, and if that was one of my hopes, it was happily met. After the second meeting our bishop rounded up the young men in our ward who have joined together to support a new friend in the ward from Samoa. 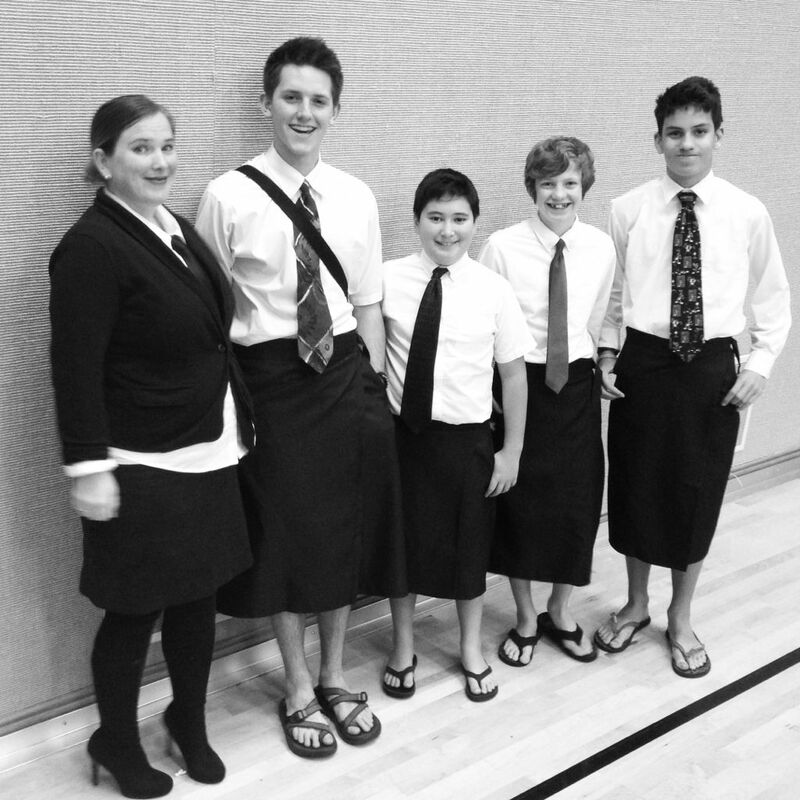 They all wear matching lava lavas every Sunday and most of them pass the sacrament in them. I've thought it was beautiful for sometime now, but as we lined up for a "photo of support" I got to tell them all. I am also grateful for a bishop who knows my heart and loves me. I always feel loved by him. Race, at my right, promised to be in the photo only if I posted it on my blog. Promised fulfilled. Then I stole some cheese crackers from the nursery because in my excitement that morning I forgot to feed myself other than two tiny clementines. I didn't want to puke on my shiny new black tie, no I didn't. In our third hour meeting I taught the young women discussion which was supposed to be about time management, but instead they wanted to know more about the tie and the pants thing. Along with two other like-minded and sincere youth leaders (one unmarried sister and one married with three young daughters) we talked to our young women about how the gospel empowers women and men to become like God. We testified that no matter where God leads them, they will always have options, there will always be support and they should never feel less for their unique paths. My skin wouldn't stop prickling up. I felt moved and grateful. The young women did a lot of the talking which to me, is a sign of time well spent. We ended the meeting with this thought from the original lesson, "the one thing that definitively makes everyone equal is time. No matter who we are or what you believe, we all have the same amount of time in a day. So choose wisely how to spend yours." Janna in pants with Millie and Kylie after the lesson in the young women class. After church we came home, ate bowls of cereal and put the girls down for a nap. I prepared for my speech I was to give that night at our ward's Evening of Excellence. But some time before then I locked myself in the bedroom, planked down on the bed and thanked my Heavenly Father for the experience of the day. For the visions and hopes he sends me in my asking. He has been good to me and I want to be better for Him. I want to be wife who serves, a mother who listens and a friend who supports. I just want to be good. The beautiful experiences of my weekend didn't make up for the evil we all witnessed, and the next day I couldn't even get out of bed with the thought of it all (Chup and the children made me breakfast in bed, at 11:30, and the kids proceeded to eat it all as soon as it was placed on my lap--it's all small sacrifices in motherhood, isn't?) but I allowed myself one morning to sit in near-silence to contemplate all I consumed this weekend.